Today, many different high performance off-road vehicles are available, but when the LM002 was released, that was not the case. 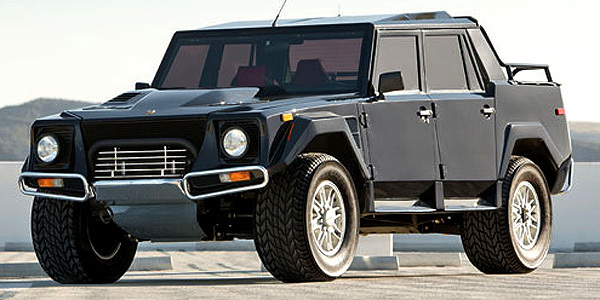 The roots for the LM002 began in 1977 with the mid-engined Cheetah concept car. Lamborghini had plans to produce the Cheetah for the U.S. military, but after those plans fell through, it was decided to develop a civilian version. This led to the LM001, LM004 and LMA development vehicles and finally resulted in the LM002 production car. The mid-engined layout of the Cheetah was abandoned due to tricky handling and the Chrysler V-8 was replaced with the legendary Lamborghini V-12 engine. With its specially made Pirelli Scorpion tires, the LM002 could conquer the sand dunes of the Middle East like nothing else. A total of only 301 left the factory, only 48 of these being the LM002-A which was especially for the American market. Indy Car racer Bobby Unser reportedly was the first owner of this LM002-A. Unser is one of only two racers that have won the Indy 500 in three different decades and is the first driver to average a speed of more than 190-mph in qualifying for the same race. Upgrades were made to the LM002 for 1990 including the change to the fuel-injected V-12 from the new Diablo, addition of MSW/OZ alloy wheels bespoke to the LM002, and a new integrated entry step. A complete engine overhaul was completed within the last 1,000 miles at a cost of over $30,000, a custom Dual Cat-Back exhaust system has been installed, and new paint was applied to the car to ensure that it was in perfect condition. Extensive receipts are available documenting this work. This is one of the finest LM002-As in existence and was even invited to be shown at The Quail, A Motorsports Gathering in 2012. The leather interior shows little-to-no wear and the V-12 has a distinctive roar. Very few LM002-As ever come up for sale and this is unquestionably one of the most attractive examples around.